Axl Rose has issued a response to being named the “World’s Greatest Singer” in a recent survey by Concert Hotels. 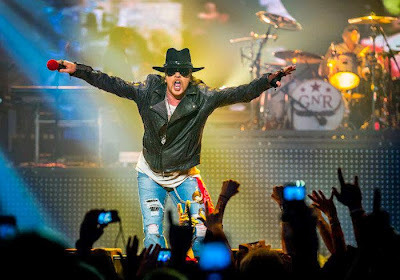 The company declared the Guns N’ Roses leader the singer with the widest vocal range – spanning more than five octaves – placing Rose ahead of singers like Mariah Carey and Prince. Now, Axl has issued a statement in response to the survey, which was also picked up by Spin magazine. “That said, I enjoy Freddie Mercury, Elvis Presley, Paul McCartney, Dan McCafferty, Janice Joplin, Michael Jackson, Elton John, Roger Daltrey, Don Henley, Jeff Lynne, Johnny Cash, Frank Sinatra, Jimmy Scott, Etta James, Fiona Apple, Chrissie Hynde, Stevie Wonder, James Brown and a ton of others (predominantly 70's rock singers) and would rather hear ANY of them anytime rather than me!,” Rose concluded. Axl and Guns N’ Roses are currently in the middle of their second Las Vegas residency. "No Trickery! An Evening Of Destruction", at The Joint at Hard Rock Hotel & Casino, will see the band perform a total of nine shows between May 21 and June 7.